After being home only a handful of weeks, I’ve since travelled again to New York City and Baltimore to attend the Museums and the Web (MW) Conference. I met many people I connected with online during the course of my journey last year and many more inspiring people. It was also overwhelming, as this latest journey was a museum-saturated experience. I had no time to explore the spaces between them as I was always inside or talking about them. Many of the overall themes at the MW conference passed me by as I responded to connections and conversations rather than following the program (which derailed me with a few surprises too). I floated around, dipped in and out and took in sessions in bite-sized chunks. Others have written summaries which capture the broader themes well, including Mairin Kerr’s collection of Twitter impressions at edigital, Micah Walter’s amusing reflections about the centrality of the visitor, and Ed Rodley’s series of posts unpacking the conference here and here. The importance of having conversations on social media, the notion of museums responding to their community, was a question that arose a few times in a way which surprised me. As an avid museum tweeter, I know many institutions don’t respond online while I’m also aware of how few have resources for it. It seems we’re still establishing its importance and it continues to be raised in the form of a hopeful question – can we have a conversation? This is despite successful examples and research into this. Chaos or connection? Pawel Althamer, “The Neighbours” (2014) at New Museum. Lindsey Marolt and I discussed her research into this topic and conclusions about the power of the simple response in successful social media accounts. 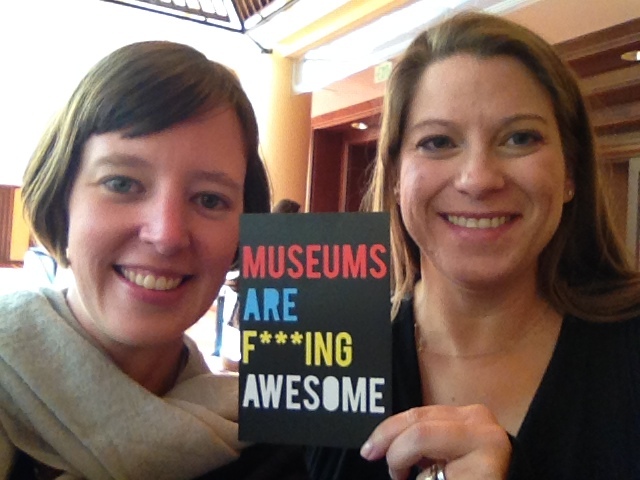 We marvelled at how many responses to content shared by museums go unreciprocated. I wondered, should we instead prioritize response and conversation over sharing more content? I hope Lindsey shares her research when it’s completed. At another point, Chad Weinard approached the question during a session on collaboration between educators and social media managers. He touched on visual thinking strategies as a way to initiate conversation in-gallery and its use as a model for conversation online. He noted the general in-house impression of this being ‘too time consuming’. Others I met have offered responses which created conversation and connection, such as Jennifer Poleon at the Columbus Museum of Art. Her Instagram-based Photo Hunt initiative (further info here) has inspired new memberships and personal connection between the museum and (within) its global community. She noted less resources have been required to obtain a big impact than you might first think. My last post, written and published during the conference, focused on one individual, Hasan Niyazi, and his power to connect communities through socially-shared photographs of art. His example rang in my mind as I considered the questions of online conversations within museum communities. My conclusion? Response is critical. A group of grass-roots, advocacy initiatives, mentioned by Ed Rodley, are on the other side of the conversation question. Here, I include initiatives which promote the sector outside of official museum accounts. To Ed’s list, I add the Museum Marathon concept initiated by David Mentiply in London and now expanded to Berlin in partnership with Jenni Fuchs. The Museum Blogger project could be included, spear-headed by Jamie Glavic, promoting voices in the sector which usually sit outside official accounts. While in New York, I had the delight of meeting Mark Schlemmer, mastermind of I Tweet Museums, and observing the careful crafting and true reach of a well-executed museum advocacy project. I also connected with Francesca De Gottardo, ring leader of the popular #SvegliaMuseo initiative based in Italy and heard about its inner-workings from a truly dedicated museum advocate. Along these lines, and as a result of MW, I’ve joined forces with the Italian Digital Invasions team. Marianna Marcucci demonstrated the initiative to a group of conference attendees by conducting a one-day whirlwind tour of five Baltimore museums. The group pumped out insights into the experience through their chosen social media accounts, creating a word-of-mouth blast of promotion. I’m now running the first Digital Invasions tour in Sydney this Saturday, 3 May, leading a group to the Museum of Contemporary Art’s permanent collection galleries and the lesser-known morbid anatomy collection at the Lucy Osburn-Nightingale Museum. If you can, please join the Digital Invasions hoard in Sydney and register here. I wonder if museums are yet to discover the art of conversation online? Can they use the example of successful individuals when engaging via social media? Is a retweet or sharing of an audience response creating a connection or do institutions need to invest more? Is it possible for an organisation to have a meaningful conversation with an individual community member or should this come from individual staff accounts? Have you experienced a connection with a museum online or do you feel conversation happens outside of organisational accounts? Me with Dana Allen-Greil at MW2014. Postcard courtesy of Museum Hack.